The 3.7-cm Flak 36 auf Selbstfahrlafette Sd.Kfz. 6/2 is a rank II German self-propelled anti-aircraft gun with a battle rating of 3.0 (AB/RB/SB). It was introduced in during the Closed Beta Test for Ground Forces before Update 1.41. The 3.7-cm Flak 36 auf Selbstfahrlafette Sd.Kfz 6/2 is a halftrack-based anti-aircraft vehicle. With its 3.7 cm cannon, it can easily dispatch any aircraft given the circumstances. However, its gun (with APHE ammo) can also make it a very good improvised anti-tank vehicle. It has enough penetration to go through front armour of most tanks at its rank, and reliably cuts through side/rear armour and weakspots (even at some range), causing impressive damage. 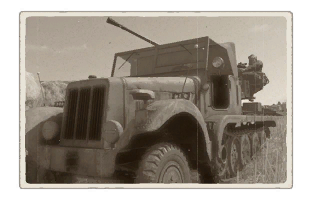 Because it is based on a simple truck, it has no armour anywhere, and even machineguns can kill the driver inside, and crew manning the turret is completely exposed. However, it can be surprisingly durable at times, mostly because of inexperienced players attacking it with AP/APCR ammo, and often targeting all the wrong places, like the Engine, Driver sitting inside, or edges of the turret armour. It has mobility comparable to a lighter medium tank, and very good cross-country performance, because of its combined wheel/track chassis. Being an SPAA, this vehicle is designed to shoot down airplanes. It was originally designed to follow alongside convoys, so to be used with other vehicles of the type. Its gun has a relatively low rate of fire for an SPAA, however, its shells pack quite the punch. Being a 37mm cannon, should it get a good hit, it will likely kill the plane. It also gets access to AP belts, which can be used against tanks. It can penetrate any medium or light tank of its rank (from the side/rear usually), but will struggle against heavier opponents like the KV-1. However, hunting tanks is not its job which is why it is not the best at that. (Armour Piercing High Explosive –Fragmentation Incendiary tracer) shell This belt is useful against lightly armoured open-topped tank destroyers, or bombers. Against other SPAA this belt can reliably take out crew, armament, ammo and engine. (Fragmentation Incendiary Tracer) shell Versus planes and open combat compartment vehicles. Lighter aircraft will often go down by a single hit. (Armour Piercing High Explosive) shell Ammo against tanks. It has comparable power to regular Rank I tanks, but combined with the Insane RoF, can be very deadly. It even has the HE filler, 3-4 well aimed penetrating hits can disable any tank. Ammo racks of the Sd.Kfz. 6/2. To use this machine to its fullest capabilities it is recommended to stay from areas of heavy combat, as you can be taken out very easily, especially by machine gun fire and HE shells. You should always stay behind friendly troops, but don't stay at spawn as it is most likely the first place enemy planes will go to drop bombs. If you want to fight with the tanks, you'll definitely need to research APHE-only belts. Go forward with your teammates, but ALWAYS stay some distance behind them, avoid any open terrain, watch the battlefield situation carefully and wait. Use your speed to get out of any unfavorable battle condition. When you find a suitable target (No KV-1...), one good idea is to reverse around the corner turned sideways, with your gun aiming at the expected enemy direction. This maneuver exposes only half of your turret, and makes it possible to very quickly hide again behind the corner when needed. Your driver, engine and more than half of the vehicle remain hidden the whole time, significantly shortening the expose time and lowering the chance of being immobilised. Aim at sides of the turret, hull, or any other weak areas. 37mm capable of dealing heavy damage to both planes and tanks (if aimed at weakspots). Deadly against light tanks and tank destroyers. Can kill T34s (Pre T34-85) if you aim at the turret cheeks. Will kill most planes in one or two hits. It does a lot more damage than the 20mm on previous SPAA. Decently fast (50 km/h top speed). Loosing 1 or 2 crewmembers have no noticable effect on vehicle performance (Apart from temporal immobilisation for example). Having no armour is also advantage - AP/APCR Rounds that most players use often just harmlessly pass through the vehicle without doing any damage. Difficult to kill in one shot unless using pure HE rounds. APHE rounds will often just pass through without detonation. Some players don't recognize this vehicle as any kind of threat, and carelessly show their sides or entire tanks, only to be easily destroyed afterwards. Friendly tanks around you often have higher priority for all enemies, meaning you can often escape from combat unharmed, or surprise unsuspecting enemies with your powerful gun. Slow rate of fire can make shooting down faster planes difficult. No armour - single HE shell from anything will usually knock out the vehicle. Very vulnerable to Artillery calls; Even being 20 m away from it does not prevent crew from being injured, or even killed. Gun goes up when it is traversing over the driver, preventing you from firing ahead of your vehicle. Entire crew vulnerable to being strafed by planes and tank machine gun fire. Ammo can run out if not careful. Knocked out easily if rammed by an airplane. Hull break, Can be hull broken with a well placed shot. The Sd.Kfz.6 was a half-track designed in 1934 for the purpose of towing the 10.5 cm leFH 18 howitzer or 11 men in the back of the half-track, which could be covered by a canvas structure to protect the crew from the elements of nature. The vehicle was powered by a Maybach HL 54TUKRM 6-cylinder engine with 115 hp. Along with its use as a tractor for the 10.5 leFH 18 howitzer and other artillery pieces, the vehicle was to be used to tow heavy equipment for engineer units. Production was carried out by both Büssing-NAG and Daimler-Benz corporations. About 750 units were made during its production life until 1942. As the World War II progressed, the need for a mobile air defense capable of engaging low flying targets became urgent. German engineers attempted to fill this need by modifying vehicles to fit an anti-aircraft gun. The Sd.kfz.6 halftrack was modified with a new superstructure on the back, removing the backseats where the passengers would be. The superstructure allow the installation of a traversible anti-aircraft gun. The gun of choice for the Sd.kfz.6 was the 3.7 cm FlaK 36, the conversion for the vehicle was designated the 3.7 cm Flak 36 auf Selbstfahrlafette Sd.Kfz.6/2. The Sd.Kfz.6/2 has the FlaK cannon mounted on the back, however there is no gun shield for the crew to provide small arms protection from the ground. Thus, ground support role for the vehicle was not a recommended role and is more best against flying targets. However, a modification on the vehicle by the crew to give protection against small arms and shrapnel. Ammunition for the gun was towed on a separate trailer towed by the half-track. Modifications on the Sd.Kfz.6 into the Sd.Kfz.6/2 were carried out from 1941 to 1943, where of the 750 of the Sd.Kfz.6, 339 were converted into the anti-aircraft variant. As the war progressed, the Sd.Kfz.6/2 were supplemented with the more numerous Sd.Kfz.7 half-track. This page was last edited on 7 April 2019, at 05:20.